Stayed here last year and enjoyed it so much it was my first choice when I came back to Chiang Mai. The staff here are so lovely!! Always full of smiles and good vibes. Is very clean,secure and comfortable. Amazing rooftop which is the perfect place to enjoy happy hour beers.. The best base to have in Chiang Mai and filled with the best people! New staff member FuFuu works very hard to make sure everyone is happy ;) thank you everyone at Thai Thai for another beautiful stay! Staff at this hostel deserve more than just 5 stars,trey trully made this experince great! They are super friendly and very helpful. No matter what your needs are,they are there ready to help you. Place is at great location,close to the old city and night bazar,it's clean,rooms are big enough for guests and their luggage (we had 6 bed mix room). Also,big terace at the roof top of the hostel is a big plus. As well as free coffe,tea,banana and snacks 24/7. A friend for mine recommended this place and he blew my mind away in setting expectations. This is not a party hostel but has good social vibes if you are willing to mingle with others. 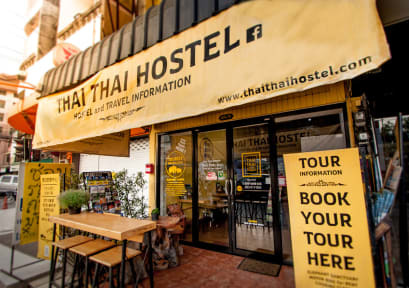 This is by far the cleanest hostel in Thailand and Vietnam. The staff as well are very helpful in booking tours, taxi and overall guiding experience without a tour guide. Reasonable fares. I stayed here at the end of my 1-month trip to Thailand and it was a breath of fresh air so to speak. It was extremely clean, quiet and comfortable... exactly what I was looking for! The beds were the comfiest of any hostel I had stayed at (I stayed at 7 of them this trip!). The staff was super helpful with any questions I had in terms of getting around the city, excursions they booked for us, and where to get food. I would definitely recommend to anyone looking for a very relaxing hostel! Excellent staff - very helpful and friendly. Layout of the hostel, including the rooftop is really cool. Lots of excursions available from the hostel too. Only con is location, it's 15-25 minute walk from the heart of the Chiang Mai action. There are however many good restaurants close by and a really nice gym (60 baht for a day pass). Overall, a good home base for Chiang Mai. Great last minute booking. Arrived at 9pm and checked out at 6am due to an early bus the next morning. Slept well and the bathroom was clean, didnt see much else of the hostel but everything was great as far as we could tell. 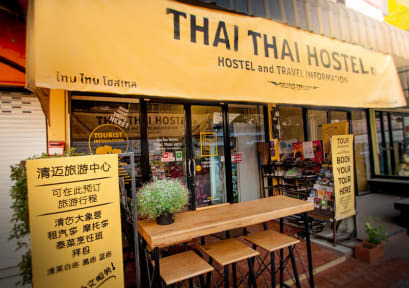 The staff at Thai Thai hostel made this place! Pluem, Jan, Pom, and Win are amazing and so willing to hangout and help. The location was solid - a nice walk to old town and some markets and such. There was always free water and fruits and snacks out literally all times of day. The cleaning girl was there all the time. We were the only guests for a few days so we don’t know how the social scene is. Overall awesome!